We’re Hiring a Collections Administrator and a Programming Officer! Duties include working with the Museum’s collection, maintaining the management and care of the Museum’s collections as directed by the Collection and Education Officer and assisting with daily operations, educational programming, exhibitions and special events. The selected candidate will gain experience in collections management, including storage, cataloguing and the photography of artefacts. Qualified applicants should submit a single PDF file containing their CV, one example of an artefact condition or catalogue report (can be prepared for this application specifically) and a letter of interest to Goulbourn Museum’s Manager, Tracey Donaldson, at goulbmus@rogers.com with the subject line “Application: Collection Administrator” by 9:00 a.m. September 11, 2018. Duties include delivering and developing Museum programs and assisting with educational programming, workshops, special events, marketing and daily operations. 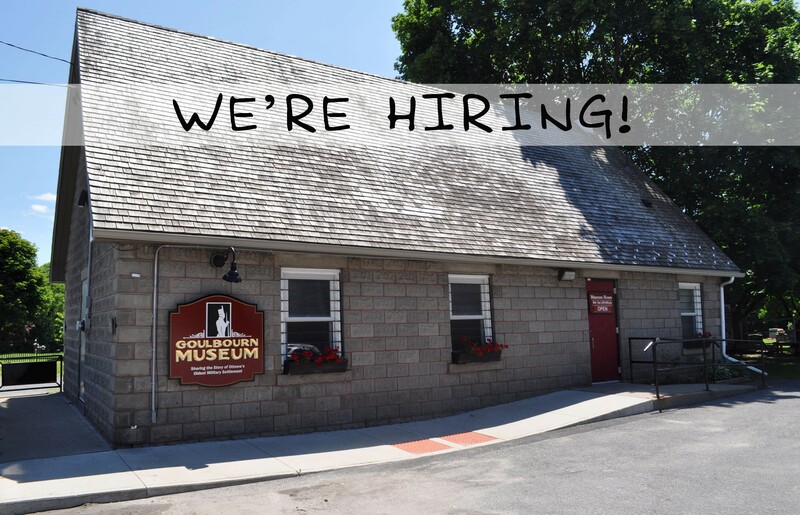 Qualified applicants should submit a single PDF file containing their CV, two writing samples (up to 500 word count/sample), and a letter of interest to Goulbourn Museum’s Manager, Tracey Donaldson, at goulbmus@rogers.com with the subject line “Application: Programming Officer” by 9:00 a.m. September 11, 2018. The Goulbourn Museum is currently accepting vendor applications for its Old-Fashioned Christmas & Outdoor Artisan Market. The market, which takes place on Sunday, November 18, is a juried show and all products must be handmade. There are just 15 spaces available. The deadline for applications is September 13, 2018. For more information, or to apply online please click HERE.